Now that CES 2018 has wound down and we've gotten our fill of buzzwords from AI and blockchain to (autonomous) vehicles, voice assistants, and wearables, what’s next? This year, we saw voice assistants (primarily Amazon Alexa) embedded in all kinds of consumer products such as refrigerators, mirrors, showers, faucets, scent machines, and toilets. Consumer healthcare products will follow the broader consumer product marketplace by integrating voice assistants into their interfaces as well. Further, with Amazon hiring a HIPAA lead, we can expect that Alexa will become a viable option for interfacing with medical devices. 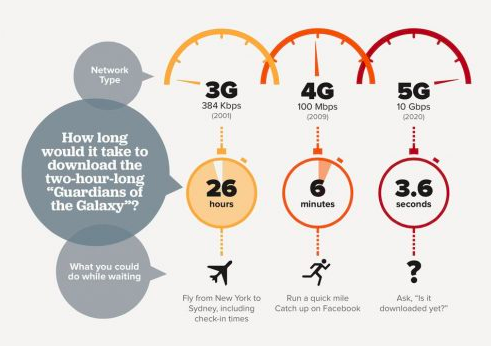 We saw more devices touting 5G connectivity – which, as seen below, is seriously fast. Along with growing adoption of interoperability standards like FHIR, 5G will enable rapid data download and aggregation from disparate sources, which in turn, will position solutions to implement unprecedented levels of machine learning to deliver real-time insights. These AI-powered applications could run the gamut from preventive care to therapeutics. Imagine a heart monitor that provides insights based not just on sensor data but also EHR, weather, and other factors that could impact heart condition management. Electromechanical and electromagnetic devices are moving out of their cottage industry phase as major pharma and consumer health companies are expanding their portfolios to support these products. There is an increasing trend towards the adoption of these devices to drive actual therapeutic impact. As witness, we just saw consumer health giant GSK ink a deal with Neurometrix for its Quell wearable pain relief unit. Bayer already has a TENS (transcutaneous electrical nerve stimulation) device on the market - Aleve Direct Therapy. This re-emergent category of devices will be warmly welcomed into the expanding umbrella of digital therapeutics and see increasing visibility and market adoption. To be clear, embedded voice, interoperability-enabled AI, and digital therapeutics are just some of the many areas where we will see digital health innovation. More broadly, while many digital health businesses like to get a splash at CES, more critical for them is finding commercial success. Success beyond CES will hinge on solutions that establish an engaging experience, verifiable health outcomes, and solid business cases.